“What would a Mexican peanut butter sandwich be like?” I asked myself one day. I'm not a huge fan of Mexican food, but some of it really peaks my taste buds. So does peanut butter. Duh. I kicked my brain into gear, putting together flavors, ingredients and cooking techniques from “south of the border,” and came up with a tasty peanut butter sandwich variation. Before you think my taste buds have gone wonky, let me assure you that the rest of my family thought it was pretty tasty, too. I even taught my middle daughter how to make them. She did quite well, thank you. This recipe makes two peanut butter quesadillas. Combine the peanut butter, re-fried beans and ground cumin in a mixing bowl. Mix until well combined. Spread the peanut butter mixture onto one side of two flour tortillas. This mixture will want to stick more to the knife than the tortilla, so you'll want to pat it down. Divide the grated cheese between the two tortillas, sprinkling evenly, and fold each one in half, making a classic quesadilla. Heat the oil a cast iron skillet over medium heat. You can use a regular skillet if you don't have a cast iron one. 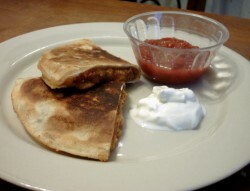 Cook the peanut butter quesadillas on each side until crispy and brown, about 2-3 minutes per side. Cook one at a time so you don't crowd your pan. Remove the cooked quesadilla from the pan and let it cool slightly, about 2 minutes. Cut each one in half and serve with extra salsa and some sour cream, if desired. I know. It sounds crazy. Maybe it is, but sometimes, crazy can be delicious. A classic peanut butter sandwich variation hailing from the South, peanut butter and tomato sandwiches are a must try. At least once, anyway. Maybe you've already had one. They're not all that uncommon. The classic sandwich is simply peanut butter, a slice of tomato, and a bit of salt. This is nice, but I felt like it needed a bit of an update. In my version, you start by toasting the bread. While that's going, mix about 2 teaspoons of tomato powder into 2 tablespoons of creamy peanut butter. (Tomato powder is very versatile and deserves a place in your food storage.) Spread this mixture on the toast, followed by a thin layer of mayonnaise. 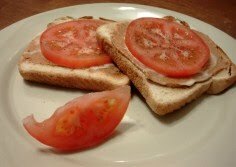 Top with a thin slice of fresh, beefsteak tomato. Sprinkle on a little onion salt and some cracked black pepper and enjoy, open faced. You can make a closed face sandwich as well, if that's your preference. If you really want to get sophisticated, try mixing the peanut butter with sun-dried tomatoes instead of topping with a fresh one. Peanut Butter and Banana Sandwich - the "Elvis"
Peanut butter and bananas, baby. The PB&B. What a great peanut butter sandwich variation. Jaqueline, of Purple Chocolat Home, came by last time and reminded me taht Elvis Presley loved these. I do, too. I like to slice the bananas thinly and overlap them on the bread. On toasted bread is nice, too. 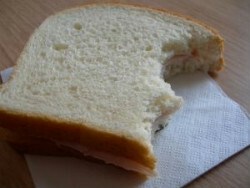 Besides the peanut butter, honey or strawberry jam are great additions to this peanut butter sandwich. Chocolate syrup is, too. It takes about one half of a banana to make one of these. 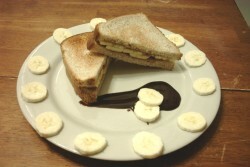 If you really want to get crazy, why not serve the sandwich with slices of the the other half of the banana and some chocolate sauce? Yum. Inspired by blogs such as Peanut Butter Boy and Scanwiches, I've decided to make April International Peanut Butter Sandwich Month at Mormon Foodie. The idea is to create and share your favorite peanut butter sandwich variations based on international cuisines. Or not. As long as they have peanut butter, that's fine. I first got the idea of a month of peanut butter sandwich variations while watching an episode of Gourmet Magazine's Diary of a Foodie on PBS. Ruth Reichl, the magazine's editor-in-chief, made a sandwich she called the “Max Special.” Simply put, it's a sandwich made with peanut butter, mayonnaise, and sliced green olives. I thought it sounded disgusting, but Ruth seemed to enjoy herself eating it. After trying it, I realized that my first impressions were mostly right. I'm not a huge fan of this sandwich. If it's not actually disgusting, at least it's an acquired taste. My oldest daughter disagrees with me, however. She quite liked it and has made them for herself from time to time every since. So, here's the challenge. Create and share your own peanut butter sandwich variations and share them with us as comments. If you find a sandwich variation you like, let us know that, too. I'll post the ones that I like best, or get the most good comments, as a “winners” post next month. They have to have peanut butter as a main ingredient. No chicken sandwiches with peanut sauce, although that sounds pretty tasty. They have to be wrapped in some kind of bread/grain product, at least enough that it can be argued that it's a sandwich. Tortillas are fine. So are rice crackers. Lettuce or nori wraps won't cut it. Anything that actually has “bread” in the title is perfect. They have to contain only food. No non-food items, such as Pokemon cards or plastic twist ties, are not allowed. That's pretty much it. Anything else goes. They can be fresh, grilled, broiled, raw, or whatever. Contest winners will get … well, I don't know. Five minutes of fame? A link to their own websites, if they have one? My undying gratitude? I don't know. Maybe I'll think up something good later. There have been all kinds of different diet plans floating around for the last several decades, Atkins , Paleolithic , Raw Food , Vegetarian , 3-hou r, 4-hour , South Beach , Manhattan … you name it. While they all have there proponents and detractors, I don't think any of them have gone far enough. Sure, they all have there rules and restrictions, but they're just mamby pamby when it comes to the diet I discovered yesterday. If you really want to lose weight, look to those individuals who have really gone and lost it: Zombies. Yes, that's right. Just look at them! They're husks of their former selves. Each one looks just as thin and emaciated as an up and coming runway model. Isn't that the look that television has been showing us is so important to have for years, now? When has TV ever lied to us? It's the perfect diet, combing the paleolithic diet with the raw foods diet. Zombies limit themselves to one food and one food only: fresh human brains. Why brains? Have you ever tried to get a fresh human brain? It's hard. You've got to work for it. First, you'll burn tons of calories and get a great cardio workout chasing those victims down. Don't get me started on how hard it is to dodge shotgun blasts, either. Once you've caught the food, it's not like it just lays down and lets you eat it. Oh no. You've got a fight on your hands. It's built in strength training! If you do manage to kill, without it escaping and starting that whole “chase thing” over again, you've got to crack the skull open. Fortunately, a few sharp thwacks against the ground will do it. Once the skull is cracked open, slurping up the brains is the reward you get for all your hard labor. Getting rewarded is important if you're going train yourself to stick to any diet. So, my friend, if you really want to lose weight, try combining your exercise with your supper. Try the zombie diet. There's nothing quite like the fresh hunt, kill, and slurp to get your juices flowing. Just watch out for shotguns. Editors note: If you find the zombie diet too difficult for you, you can ease yourself into it by trying cannibalism, first.